Welp, that looks like pee. Some things do. Let's get right started, I heard about this from Hoosier and thought I'd give it a try. I like it! This replaces my green tea and lemon habit, and is even easier because there's no lemon to cut up, just a big ol' bottle of Bragg Apple Cider Vinegar. It says 1-2 tsp vinegar in 8 oz water on the Bragg bottle, which is what I started with, then upped it to 1 Tbsp vinegar in 12 oz water. 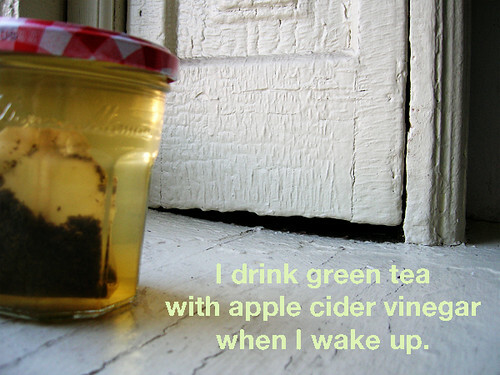 I threw in the green tea bag just so I wouldn't lose those antioxidants, and found that it also mellows out the vinegar taste. Then I needed all the 12 oz mason jars for chicken and soup, so I went back to the 8 oz Bonne Maman jars but stuck with the 1 Tbsp vinegar. Fin. I mean, why apple cider vinegar? Said the girl who clearly does not know that Fin means the end. Hoosier said it would make me smarter. Otherwise I'm interested in apple cider vinegar's antibiotic and anti-inflammatory properties, and it's also supposed to help digestion. And it honestly tastes good to me, remember how Ma sends Carrie with a jug of ginger vinegar water to Pa and Laura and it's so super delicious? Though Sparty says it tastes like dyeing Easter eggs in her mouth, so your mileage may vary. Pretty easy, I drop a tea bag into a Bonne Maman jelly jar, pour over whatever hot water is on the stove from the sweetie man's evening tea, and measure a tablespoon of apple cider vinegar. Put the lid on the jar and put the jar on my nightstand where it sits and steeps overnight. When I wake up, I drink the tea.